I wanted to make a flow chart. I spent about two hours inside Google Documents using their drawing template to make spreadsheets. What I discovered is that so much of the information crossed referenced itself that I had no idea how to turn it into a comprehensible flow chart. Skills are not as linear as they seem. Controlled Bursts for example only effect hybrid and laser weapons because projectiles are capless. Support skills don't have to be learned, even for some capital class ships, modules, or weapons. You can go your entire eve career without training armor and shield resistance skills or any sensor compensation skills. Eve's skill tree is complex and it is flexible. I like that about it. It is also not the easiest thing to sit down and look at. I'd never thought twice about that until I spent the last week in rookie chat and kept linking skills for people who did not know how to find them. I asked myself, "How do you find skills?" There are a few ways. If you use 'show info' you get a window that pops up and has a tab called requirements. Each requirement has a show info icon you can select to find out more about the skills. The item will also tell you if you have or have not learned the skills or have not learned enough levels of the skills. But that won't help you find support skills that are not required by anything but just help. The way those are found is by searching the market. So, I did a sanity check. I turned to my husband and explained to him how you use the market to look for skills. He said, "What?" and said that it did not make a lot of sense to him to use the market to learn about skills. No... no it does not. I am simply used to it and know how to use the market as a greater and more flexible tool than buying and selling things. I found the group window of the market early on and used that to pick up skills. Later, I used my ships and modules to help me. But... that is a lot of work and a lot of windows opening and losing and going back and forth. I wanted to make something fairly simple and all in one spot. That is why I started with a flow chart. But as I started working on it I found that a flow chart did not quite work for what I wanted to do. So, I decided to do what was easiest and write it out which is where I got the tables from. What I've made I'm loosely called Skills at a Glance v1.0. It is currently missing invention skills for T2 and T3 items. The goal is to build it into a website. The first response was, "I'd have made it a spreadsheet." Well, spreadsheets are not very readable in my opinion. I wanted one single document that could be converted into a PDF or loaded onto a website and read in a simple way. I very much feel that a skill tree is needed in the game. For now, I'm putting forth my imperfect effort to gather up the very basic information for skills and put them into a format that is easier to look at. It needs a lot of refining but I'm happy with where it is. I've hit a lot of frustrations. The "required for" tab is not clear that you have to click on the mastery levels to see all of the information. I didn't realize that at first and wondered why so much information was randomly missing. That may absolutely be a me thing since that tab is new and I ignore the mastery aspect of th information tab. Anyway, Corbexx is helping me figure out how to best lay out the T2 and T3 invention skills for readability. I'll probably put some details after the table of contents to expand upon what they are. I'm open to feedback to make this a better and more useful tool. Once it is cleaned up a few versions I will transplant it into a permanent blog page. If you like it please share the link for it! If you can take the data and make a cooler tool, please do! I hope CCP continues the process of modifying or replacing unhelpfully tedious and unnecessary items or skills from the game. The switch away from four obscurely named levels of meta for two versions, the low fitting and higher performance ones, is a positive step. Some obscure fits will be lost, but it's small potatoes. Specialist modules with tradeoffs and consistent naming conventions would have allowed for a deeper fittings game, but beggars can't be choosers. Next up is truncation of basic and civilian gear. The market can barely be navigated without calling up a variants tab, carefully setting up an entire replacement of the market categories for favorites folders, or just sticking to familiar name brands. If nothing else, icons or categories for basic modules could enable rapid identification, especially if available in the relevant screens. As for fitting and universal skills, they are the main factor driving the tedious chorus of "everyone catches up quick with specialization." They also reinforce the notion that the averaged half-life on EVE subscriptions is buffered by the sunk cost fallacy. The differences in fitting (and performance) for, say, different calibres of guns are often too subtle to really be measured in most fitting attempts. Role should be a more important deciding factor for fit selection than resources. Thinking about modules in terms of roles illuminates where we need more of them, or more diversified forms of them. More often than not, fitting skills are perceived as a forced timeout and logoff by most new players, regardless of whether they perceive it wrongly or rightly. There isn't good enough availability of civilian/basic versions of things to promote experimentation by new players even if they could be identified at a glance. CCP over-relies on surviving players to engage in the tedious process of correcting wrong notions. It wouldn't kill them to take an interest in their own product to the point of presenting new players with less vague info, or even a few role-suited fits. They know 90% of their potential clients simply walk away, and that means the rest of us don't need to have sympathy for them. They have a wiki, even if it isn't as good as the EVE-Uni one, so why don't they tie it into the "show info" system. Perhaps CCP could do an end run around universal skills by making them efficiency skills, creating less variable pg/cpu output of ships, but making them more profitable or less costly to fly by more skilled players. Perhaps instead there could be some passive benefits to having unused ship pg or cpu. If the server could handle it, maybe they could even implement the much-hated idea of fuel (or expand and diversify the use of charges in modules), simply because it can address so many concerns. Sugar... with your knowledge of and experience with EVE Uni, I was very surprised you had not just asked them or seen the above link to EU's Skill Trees before... I have been using these for some time now. That plus ISIS gets you everything and more than you could possibly want to know about skilling for a ship etc. You get more or less the same display as in the market but here it is. I know a lot of people who discover usefull skills via the certificate/mastery list. 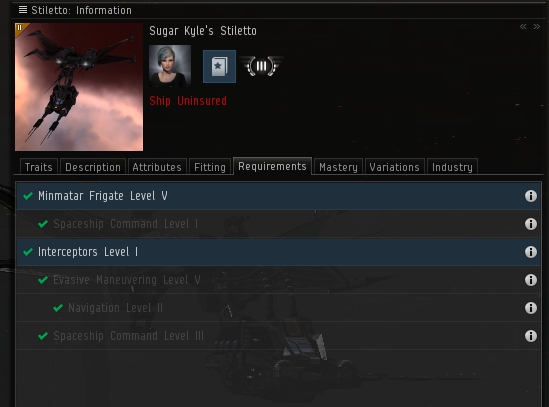 Got a correction for your corp management section: Sovereignty isn't required to take sov in nullsec, a corp within an alliance, no matter how skilled the leader can put up a Territorial Claim Unit and take sovereignty of a system. Cool thanks. I honestly always assumed that was part of the game plan. Now I know. Anchoring IV is required for Pos Guns still. Anchoring V is also required for Station Construction and Anchoring. I'm in the chat room on your document, btw. Having a general overview of what each skill group does might be helpful to new players as well. A blurb saying that these skills effect you doing 'x' and subdividing them by their effects. Examples: The trade skills that increase number of market orders could all be put together and showed as a path with final numbers. Corp skills that increase member count capacity: Fully trained and applied to a corp, you can have up to 12,600 members in a single corp.
Armor/Shield: The skills that upgrade the resistances could be grouped for clarity. Yes. I started regrouping things not alphabetically about halfway through. I'll go back I think and rearrange some of the other things into groups. The more linear grouping can be seen in how I broke up spaceship command and turrets. As a noob, I learned about skills through EveMon. Once I had the link for EveMon, I learned about API keys as well...then EFT and PYFA were quite simple. 1. I want to fly this ship. What skills do I need? 3. What skills do I need in order to fly a ship fit like the one labeled "xxxx PVP" fit. Must be good, as it has 8 upvotes. What can I learn from this fit? How long will it take me to train for that fitting? 1. Skill Explorer - What is this skill used for? Research shows people learn using different modalities. Some learn by reading, others by doing. EveMon offers assistance for both types of learners. Two thumbs up for Evemon! Personally I started out looking at skills on the Market. I got Evemon within a few days but didn't use it much for the first few months because I believe in learning to do things myself first before using tools that make it easy. Now I have a lot of characters and Evemon is huge help. It'd be a real chore trying to keep up with training them all without it. Especially before they removed the 24 hour limit. There really should be a way to search for stuff without using the market. I use the market way more as a search engine than as somewhere to buy/sell stuff. So an easier/quicker way to search for things would be nice. the best bet to making a flowchart aided system is to start with http://swiftandbitter.com/eve/wtd/ and work your way down the list starting with a new character and EFT with an eye for the most economical way to do it based on being a n00b. The biggest concerns are running out of capacitor, and being able to anticipate tanking skill needs like shield upgrades for lessened power requirements, if applicable for ship choice.